Crew from Australia´s Getaway shooting a stand-up with the host. 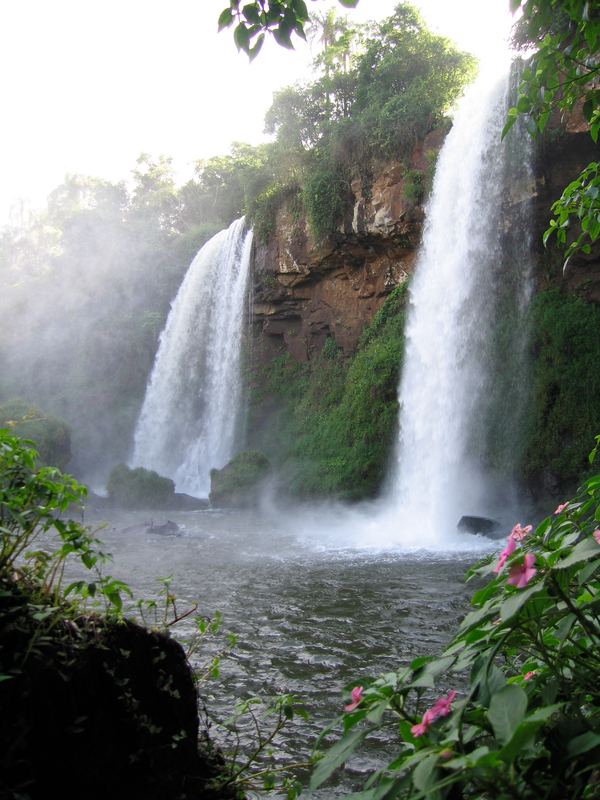 Can there be a more spectacular location than Iguazú Falls? Named one of the new Seven Natural Wonders of the World, national parks on the Argentina and Brazil side (called Iguassu or Iguaçu in Portugues) feature lush jungles, exotic wildlife and the roar of water tumbling down “Devil´s Throat” and “Adam and Eve”. 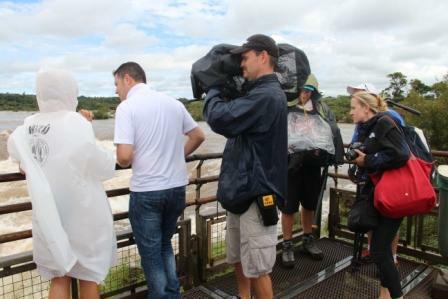 From the Brazilian side you can get wonderful panoramic views, on the Argentine side you are “in the photograph” getting up close to falls and able to film them from varying heights. WORK VISAS Don´t worry, this is a fairly simple process. You will need to be invited by a local production company, such as San Telmo Productions who can issue an official invitation that needs to be fed-exed to you. Processing time depends on your local consualte, but estimate between 10-30 days. The visas are necessary because the national parks department will request the visa numbers for every foreign crew member who will be on the film permit. If you try to film without a permit, the parks service will stop you. FILM PERMIT This is obtained via the national parks office in Iguazu. 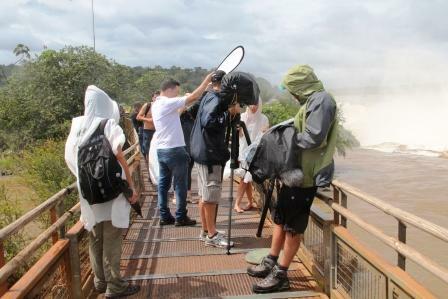 At San Telmo Productions we have a location manager on the ground in Misiones province who can use her personal connections to expedite the process. If this is for a documentary or TV shoot that will promote Argentina as a tourist destination, this will work in your favor to reduce fees. Fees vary for documentary and fiction shoots. Like anything, this can be put on a “rush” order but the office recommends 40 working days to process (we´ve gotten it done in less than two weeks, but this is extra work). Remember, as it is national park no filming is permited that will have a negative environmental impact. If you are looking for something more extreme (like throwing a car off the falls) we can scout nearby locations of smaller falls located in provincial parks and on private property. CUSTOMS If you are bringing equipment into Brazil or Argentina you will need customs clearance. Argentina is not a CARNET country. At San Telmo Productions we can arrange this for you. You will also need clearance if crossing into Argentina from Brazil. Another alternative is to rent locally from Buenos Aires or Sao Paulo. Best time of the year to shoot: The views are the same year round, but it can get very hot and buggy between November and March. Try to stay away from national holidays when the park can get very full. As this is a subtropical forrest, it will never get cold but there are differences in seasons. The entire region is a center of tourism and there are 5 star luxury inside the park, as well as more economical options . Roads and infrastructure are in good shape, and there both the Brazilian and Argentine airport offer a wide range of flights daily. We recently produced a shoot for the Australian Program “Getaway” without a hitch, as well as a shoot for a corporate film for the German company Energetix and did location scouting for Indian villages for a German movie in pre-production. With propper planning and good logistics, shooting the falls will add “wow” to your next project!